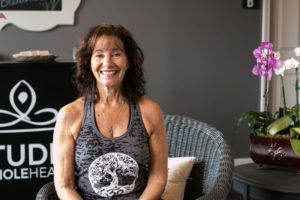 Gigi is an RYT 200 Yoga Instructor and a Certified Health Coach whose passion in life is health and fitness – both of the body and of the mind. She spent the past 10 years working as a technical writer for the medical industry. The more she learned about the human body, the more her passion grew for health and fitness. This passion drove her to enroll in a health coaching course with the Institute for Integrative Nutrition. Gigi received her health coaching certification in 2013. Gigi believes the human body, in its most natural state, is perfectly balanced – like a perfectly balanced chemical equation. The things we put in our body nourish and energize us, or they take from us, zapping our energy -and she’s not just talking about food! Fitness is about balancing all areas of life including relationships, career, education, spirituality, home, physical activity and finances. Gigi’s goal is to help you learn more about yourself. What makes you tic? What’s holding you back from enjoying life to the fullest? She’ll help you map it out on paper and work with you to find balance in the areas that are holding you back. She’ll also teach you about crowding out unhealthy choices and habits with healthier ones that leave you feeling energized, with a new zest for life! Gigi loves a challenge and just can’t say no to an adventure! She participates in all kinds of physical fitness, from kick boxing, Zumba and yoga, to half marathons and triathlons. She also enjoys volunteer work abroad, studying any topic related to health, hiking, yard work, reading, and brain games. Gigi graduated from the University of South Florida with a degree in Accounting and lives in Hartwell, GA, with her husband Omar. She has two grown children.